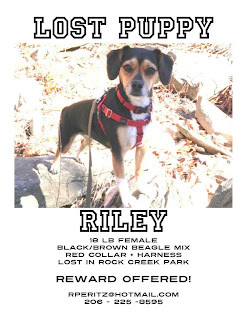 Find Lost Beagle Sassafras! : Help Find Riley! I'm so happy to hear this!!! Now it is Sassafras' turn to be found. I hope and pray everyday. I'm also in disbelief that she can't be found with so much news about her and so many people around. If it is time for something new or another tracker please let me know what I can do to help. Don't forget that many pets have been found after many years.